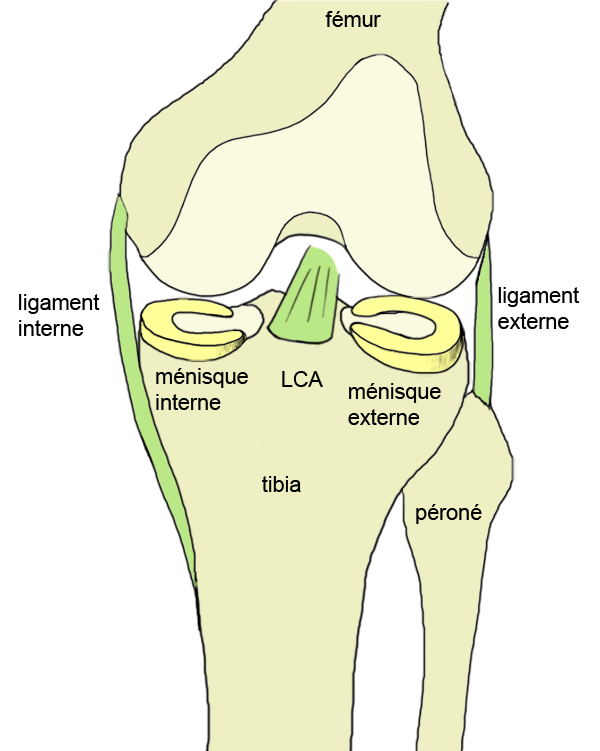 The tibia, the LCAE fits on pre-spinal area in front of the tibial spines, behind the anterior horn of the medial meniscus. This insertion zone is both bone and periosteal a triangular side surface in the horizontal plane of 2.5 to 3 cm. 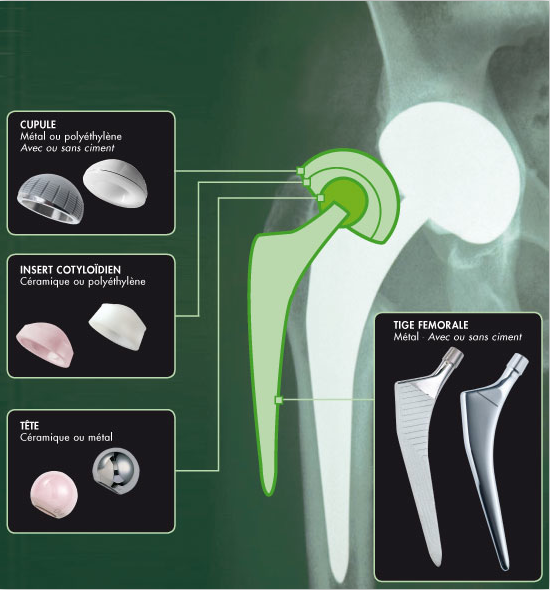 The femur, the LCAE fits on the axial face of the lateral femoral condyle along a substantially vertical axis, very posterior kidney-shaped with a rectilinear anterior edge of about 2 cm². 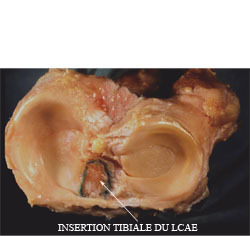 The tibial insert is larger than the femoral insertion: the LCAE widens in tibial femoral and has a twist of its fibers. This twist allows the leading edge of LCAE to be straight and concave up well beyond the front edge of the intercondylar notch in full extension. 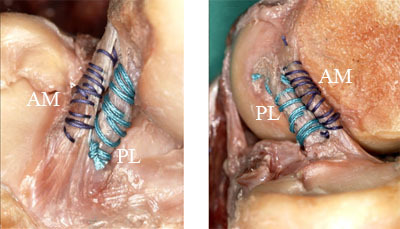 The LCAE consists of several fiber bundles, the two most important are the anteromedial bundle and the posterolateral bundle (from their tibial insertion). 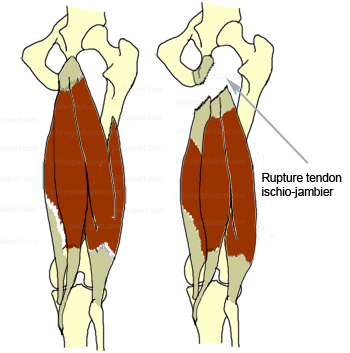 The anteromedial bundle (insertion anterior and medial tibial femoral insertion and subsequent high) is defined so that its most anterior tibial fibers become more posterior to the femur (mean length 3.3 cm). 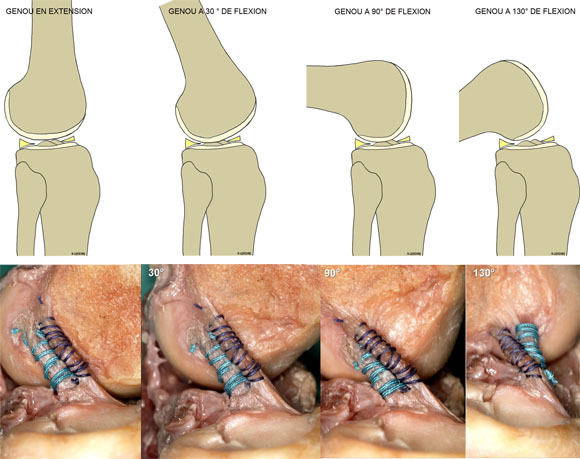 The posterolateral tibial insertion beam back and outside the anteromedial bundle; shorter and more vertical it fits low on the axial face of the lateral condyle. This provision (in fact more complex) said twisting of the fibers during LCAE flexion extension with recruitment voltage of certain fibers in the flexion extension movements. Thus, during the maneuver Lachman, the anteromedial bundle is tensioned mainly. 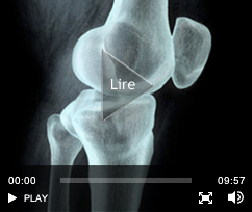 KNEE IN EXTENSION, vertical LCAE comes into contact with the intercondylar notch. The 2 main beams are strained. The hyper extension and recurvatum accentuate the tension of these two beams. KNEE BENDING, the LCAE becomes horizontal. Its voltage varies contingent considered fibers. 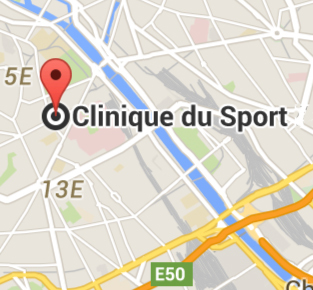 The anteromedial bundle loosens, the posterolateral bundle remains tense. Hyper flexion, the two beams retendent. 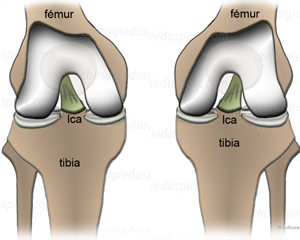 The distance between the center of both tibial and femoral insertions of LCAE remains constant regardless of the degree of knee flexion what defines the isometric. 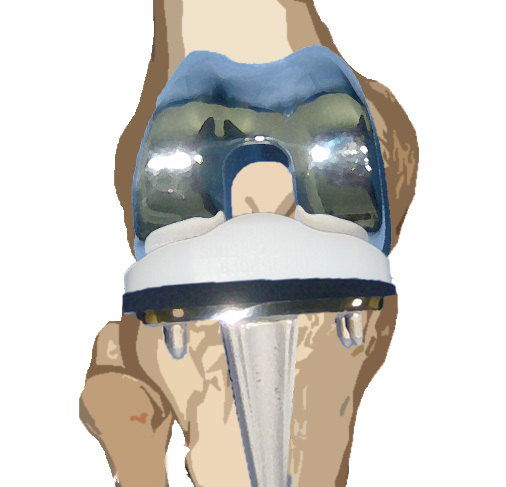 In fact, the ligament system of the central pivot of the knee is considered a related system of 4 bars. 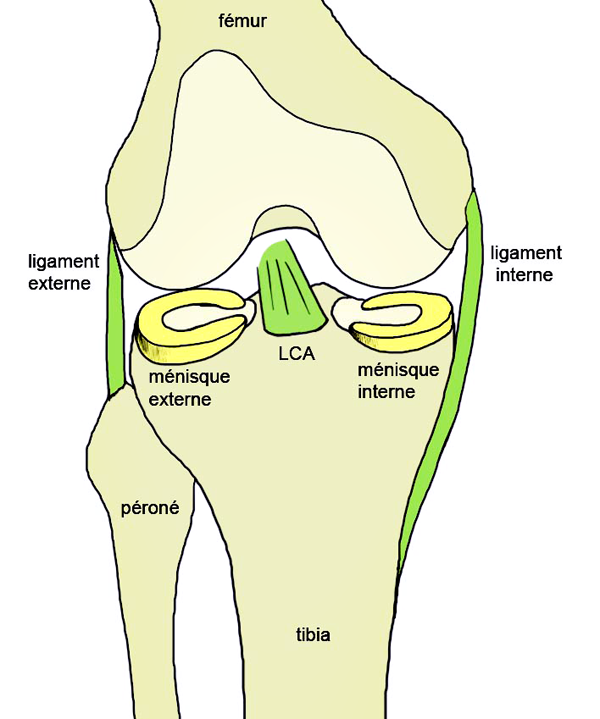 To facilitate the analysis, at each ligament is a "neutral fiber" whose length remains constant irrespective of the position of the knee (isometric fiber), the instantaneous center of the joint and the bending axis lies the intersection of these neutral axes irrespective of the position of the knee. All fibers situated in front of the neutral fibers are strained during bending, as opposed to fibers situated behind these neutral fibers are distended. Given the torsion LCAE flexion, antero-medial fibers strained extension find themselves posterior to the femur in flexion and therefore relaxed opposite postero-lateral fibers. This better explains anatomical and functional knowledge advances in surgery LCAE; respect for the isometric remains a fundamental concept, provided it goes hand in hand with anatomical positioning of the graft, restoring normal kinetic articulation in all three planes of space. The tensile behavior of ligaments resulting from their collagen structure. 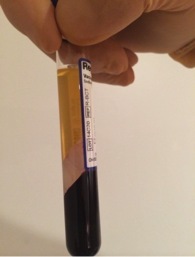 In no load, the collagen fibers have a wavy appearance. 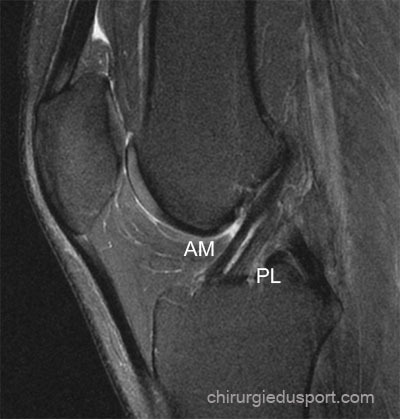 This wavy pattern disappears when the power in charge of the ligament without initial change of its length, and it is only when the load reaches a certain level that the fibers become longer (spring load), which corresponds to an elongation of about 4% ligament. If the load increases, so she reached a breaking (breaking load) where the fibers are torn. Collagen fibers are surrounded by a basic substance and weakly linked to each other. This structure explains the load-deformation behavior depends on the rate of application of the load. Pictorially, it is easier to move slowly as quickly in a viscous liquid. 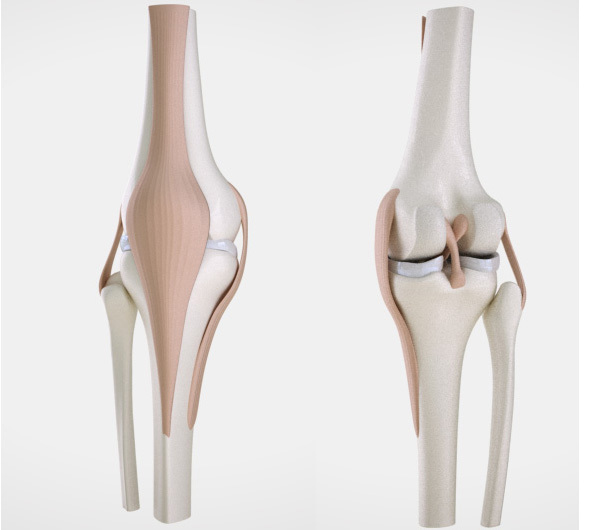 When a call for fast load is applied, the ligament tends to break in the middle so that in case of slow charging, it will peel more easily near or at its bony avulsion. 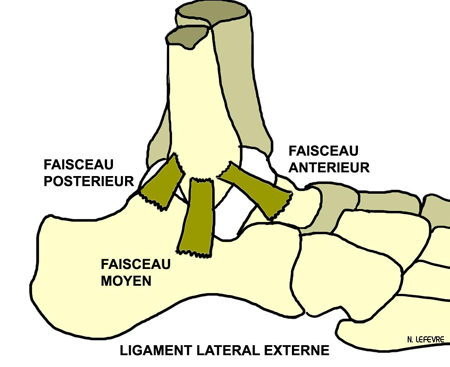 Moreover, in case of application of repeated load above the elastic load but below the breaking load, the ligament can flow that is to say, lie down and lose its mechanical properties gradually over time to lead to fatigue failure (or fibrous transformation without functional value). This phenomenon is very important for ligament grafts (graft tissue is more vulnerable than the normal ligament tissue creep especially during the graft maturation phase). This explains the gradual relaxation of a transplant in time, especially if these insertion sites are not in anatomical position. 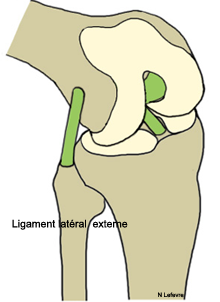 A primary brake is a ligament that resists most of the load which tends to move a piece of bone relative to each other. At the knee, and for different positions for a given displacement load distribution between primary and secondary brake brakes varies. At the start of bending, LCAE is oriented to oppose an anterior drawer force, PAPI appearing as a secondary brake. In case of injury LCAE, secondary brakes are most in demand, which explains their high relaxation in case of untreated initial injury. 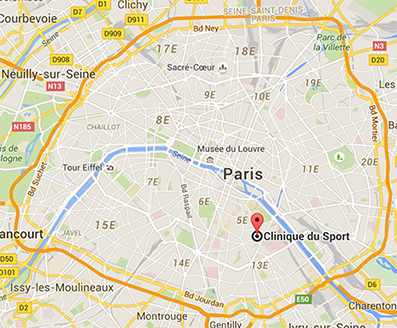 Doctor Serge HERMAN, Doctor Nicolas LEFEVRE, Doctor Yoann BOHU. 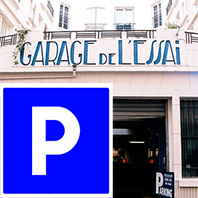 - 13 février 2012.